Rose Schneiderman was born Rachel Schneiderman in Savin, Poland in 1882 and immigrated to the United States in 1890. Her father, Samuel, died of meningitis two years after their arrival in New York City leaving three children and a pregnant wife. Deborah Rothman Schneiderman did her best to support her children, Rose (eldest), Harry, Charles, and Jane (Jennie). She took in boarders, sewed and washed for neighbors, and even worked as a janitress. Still, for a time, she was forced to place her three children in an orphanage. When Rose returned home, her mother worked nights so that Rose could attend school. But in 1895, when her mother lost her job, thirteen-year-old Rose was forced to leave school and enter the paid workforce. For a short time Rose was a department store clerk and then worked sewing caps. In 1903 Schneiderman helped organize a New York City local of the United Cloth and Cap Makers and took the lead in getting women elected to the union. The next year she was elected to the union’s executive board, the highest position yet held by a woman in any American labor organization. From 1905 through the 1950’s Schneiderman was one of the most active members of the Women’s Trade Union League (WTUL) rising to national president. Also an organizer for the International Ladies Garment Workers Union from 1914 to 1916, she is best known for her leadership in the Girls Shirtwaist Strike in 1909 and her landmark speech after the Triangle Fire in 1911. 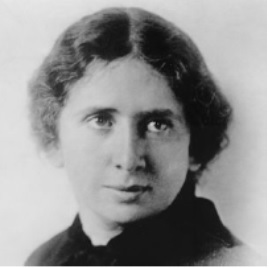 Rose Schneiderman was a well -known suffrage speaker from 1907 through 1920. She was the head of the industrial section of the New York Women’s Suffrage Association in 1917 and a member of the National American Woman Suffrage Association (NAWSA). She traveled the east coast and the mid-west speaking for suffrage on behalf of the NAWSA. Schneiderman, a Jewish immigrant at four feet six inches tall with striking red hair was one of the few working – class, non-native born women traveling the country speaking on behalf of suffrage. She was a founding member of the Equality League of Self- Supporting Women in 1907 with Harriot Stanton Blatch, daughter of Elizabeth Cady Stanton, and Leonora O’Reilly, labor leader and dynamic suffrage speaker. Schneiderman, Blatch, and Charlotte Perkins Gilman, well known writer and women’s activist, had spoken about suffrage together including at Cooper Union in 1907. In 1909 Schneiderman was one of a star-studded suffrage group who spoke in the graveyard across from Vassar College to about 50 students, professors and local citizens of Poughkeepsie, NY. Inez Milholland Boissevain organized the lecture banned from the Vassar campus by President Taylor. On February 2, 1914, Schneiderman, and four other activists, Glendower Evans, Margaret Hinchey, Rose Winslow and Melinda Scott lead 300 to 400 working class suffragists and their allies from a mass meeting of the NAWSA to the White House. Schneiderman and the four other activists spoke to Woodrow Wilson in his chambers, pleading with him to support women’s suffrage. Schneiderman helped organize the first International Conference of Working Women in 1919. In 1920 she ran but lost the race for the US Senate on the New York Labor Party ticket. She began advising President Franklin and Eleanor Roosevelt on labor issues, and in 1933 FDR appointed her to the Labor Advisory Board for the National Industrial Recovery Administration, as the only woman member. Schneiderman was Secretary of the New York State Department of Labor from 1937 until 1943. Her memoir, All for One, was published in 1967. She lectured widely before diverse audiences and served on various boards, ending her long life as one of the most respected spokespersons and activists for improving the conditions of working people. Although later a firm opponent of the Equal Rights Amendment along with other well known industrial feminists such as Frances Perkins, she contributed greatly to the passing of the women’s suffrage laws in New York and nationally. Sources: Photo courtesy of the Library of Congress Prints and Photographs Division (LC-USZ62-112772).